Your digital compliance binder is here. Easily generate policies, HIPAA risk analysis, and track your compliance efforts for HIPAA, OSHA, CPR Management and Healthcare Billing policies – all online. Need compliance training? We've got that, too! No need to study lengthy compliance regulations. Just answer yes or no. that generate a tailored, digital compliance binder that can be accessed from anywhere. Complete annual review of OSHA and get tailored policies, annual staff training and digital management of compliance efforts. 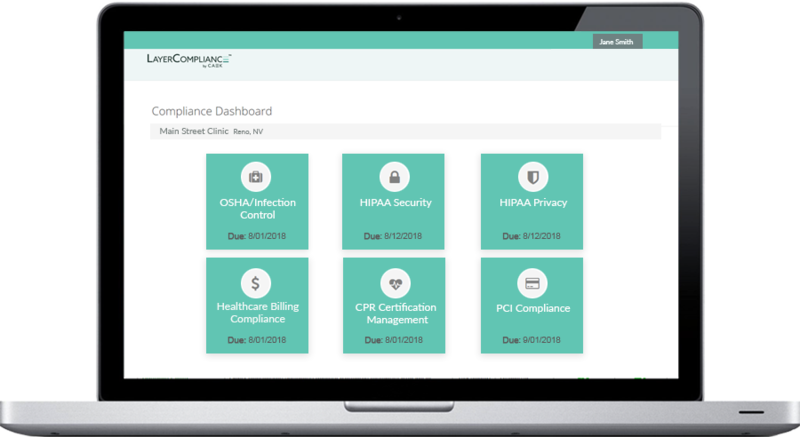 From your annual risk assessment, risk analysis and staff training, to tailored policy documents and risk management, streamline your HIPAA compliance using the LayerCompliance dashboard. Receive notification 90 days before any staff CPR certifications expire. Get the tools to assist you in implementing a healthcare billing compliance program that is based on the seven basic components of compliance. Generate and complete your annual review of OSHA and Infection Control policies by using the easy-to-follow "to do list" format. Know exactly what has been completed and what is still pending. And receive continual program evaluation reminders throughout the year. Module includes tailored policies (in a digital format), annual staff training, and digital management of compliance efforts. Follows the CDC published guidelines for infection control in healthcare. From your annual risk assessment, risk analysis and staff training, to tailored policy documents and risk management, streamline your HIPAA compliance using the LayerCompliance dashboard. Utilizing the HIPAA task list and regular HIPAA task reminders, compliance officers can easily manage and document HIPAA compliance efforts. Also includes the HIPAA Advancing Care Information Report for MACRA/MIPS. Avoid fraudulent claims. Get the tools to assist you in implementing a healthcare billing compliance program that is based on the seven basic components of compliance, including fraud and abuse laws and ways to monitor your relationship with payers, other healthcare providers, and vendors. **While the module includes policies and checklists for implementing a billing compliance program, it does not provide education, guidance, or support for specific CDT, CPT, HCPCS, or ICD-10 codes and or use of specific codes or qualifiers when submitting claims. © 2019 - All Rights Reserved - HRM SERVICES, INC. | DBA CAEK, INC.